The kids and I took on another project from the 2016 Taste of Home Halloween magazine. They are loving my continued willingness to make sugary treats in the spirit of Halloween! 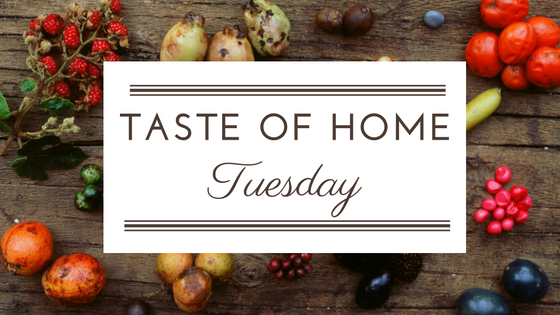 I'm loving it too :) Giving these little treats a try also gave me the opportunity to test out another recipe for Taste of Home Tuesday, as hosted by Maureen on Red Cottage Chronicles. Check out all of the links at the bottom of this post to see what everyone else tried this week! This recipe definitely didn't disappoint. Like the Spooky Brownie Haunted House, this would be another perfect treat to bring to a Halloween party. 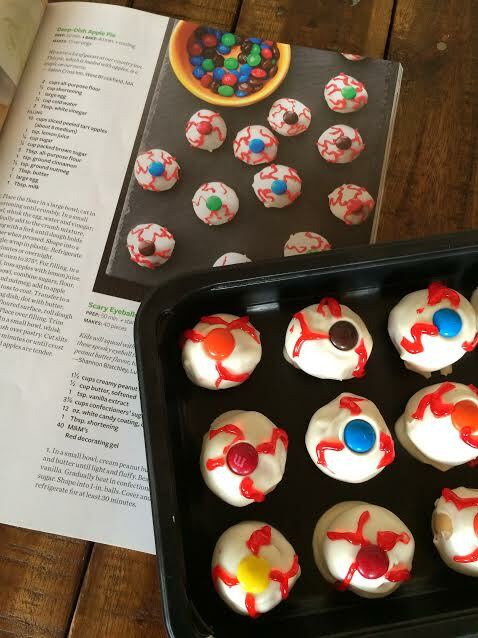 The recipe made 42 spooky little eyeballs for us, and believe me when I say that a little bit goes a LONG way with this recipe. They are super sweet, and very rich. Don't worry though, this isn't a bad thing! They are bursting with velvety peanut butter filling, but they definitely pack a punch of sugary goodness. Another advantage to this recipe is that I found that these little treats froze extremely well. I fully decorated half of the eyeballs with the red gel to take to a friend's house, and then froze the other half without drawing on the red details. When ready to serve, I just took them out of the freezer, let thaw, and decorated with the red gel. 1. In a small bowl, cream peanut butter and butter until light and fluffy. Beat in vanilla. Gradually beat in confectioners' sugar. Shape into 1-in. balls. Cover and refrigerate for at least 30 minutes. 2. In a microwave-safe bowl, melt candy coating and shortening; stir until smooth. Dip peanut butter balls into coating; allow excess to drip off. Place on waxed paper. Place M&M's, plain side up, on top. Let stand until set. Use red gel to create "bloodshot" eyes. Oh my goodness! I love these. What a fun treat for Halloween! These are really adorable and a fun way to get kids in the kitchen to help. Perfect for a Halloween party.